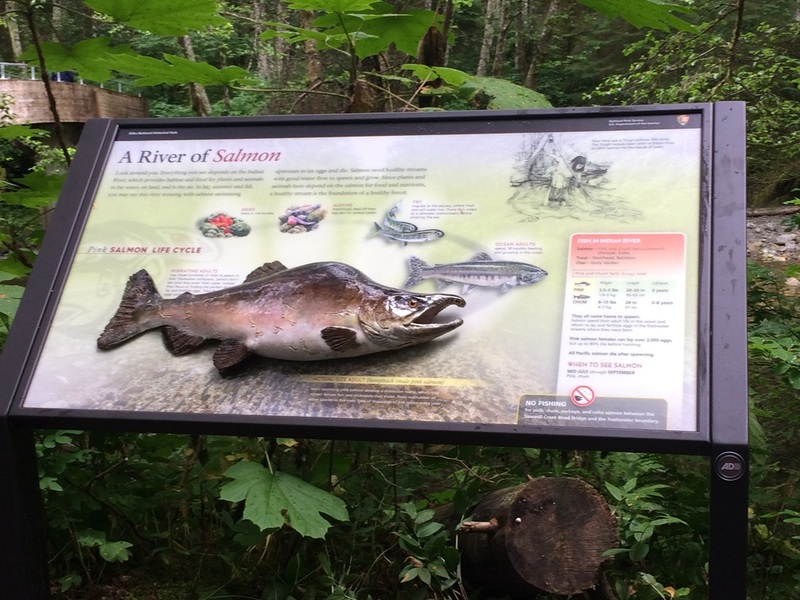 ​The project incorporates 16 wayside exhibits and totem poles along a forested trail, two trail head orientation panels with maps, elements of the landscape to include spawning salmon, a dormant volcano and the Indian river. 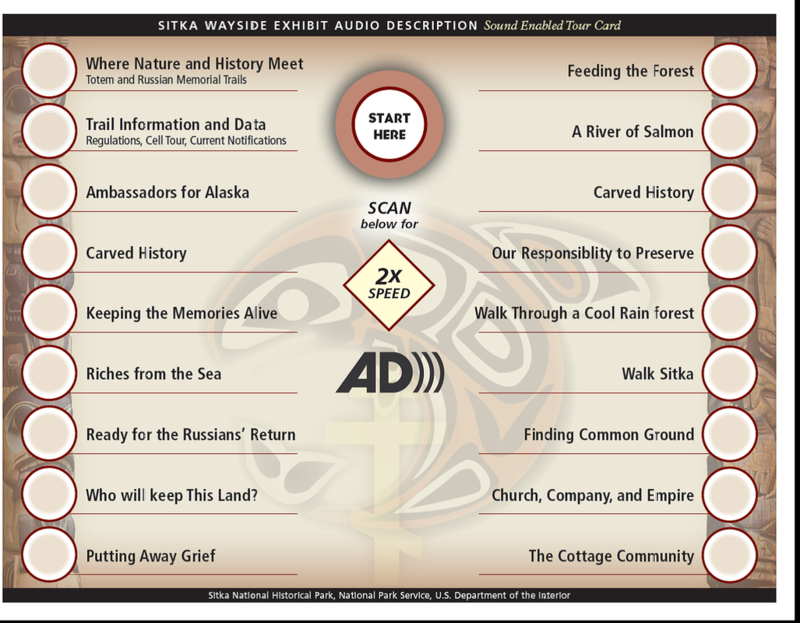 Historical Russian buildings in downtown Sitka are also described with waysides and audio. Audio Description style and technology was developed to provide direct interaction with exhibits, independence, access to other media and tours and engagement with landscape. Audio description was developed for the broadest audience by using a holistic approach to accessible interpretation. The audio description script was written with a fresh, narrative based storytelling style that incorporates the landscape surrounding each wayside, panel content, graphics, QR code content, maps, tactile model and bonus interpretive opportunities available onsite while maintaining standard audio description directional components that guide the visitor through the panel. A handheld audio device, the Discovery Pen, was introduced that allows visitors to trigger audio description on the outdoor wayside, engaging them directly with the story of the landscape. 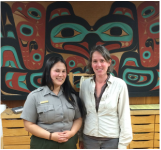 Audio Describer,Julie Hein-Frank of Lake Ledge and Sitka's Chief of Interpretation, Becky Latanich, discuss options to address the balance of large amounts of content concerning a street map and totem pole facts for the Walk Sitka panel. The solution: chunk the sound files, using a "layer audio" feature of the Discovery Pen. Visitors select either Totem Pole Facts or Learn about Area attractions. The choice is theirs based on interest and time. ​and their companions and also those who prefer to receive content through auditory pathways will enjoy the rich detail description provides. Two voices (male and female) were used to keep the content engaging and bird song with rich descriptions of landscape immerse the visitor in the setting. Panel content included Tlingit and Russian words that required accurate pronunciation and native voice. Julie met with and recorded native speakers to ensure correct pronunciations during voice production. Native Tlingit and Russian speakers also voiced important elements of the script. We created tour options at faster rates of speech to better serve visitors who are visually impaired. Special factors for this project included the understanding that many people who are blind prefer audio content at a faster rate of speech. Focus groups were arranged to determine what rate of speech might best meet the needs of the diversity of individuals with visual impairments so that we could create audio description tour options at rates of speech that would suit the broadest audience of visually impaired users. Tour length is cut in half when using speed tracks. A definite plus. Sound enabled medallions are adhered to each wayside along the trail allowing visitors to interact directly with the wayside in the landscape. Multiple ways of accessing Audio Description content are provided. Sound enabled laminate cards are available to those who are unable to complete the trail or for visitors to use in inclement weather. The site had existing mobile phone audio tours and QR code audio and video hat were made accessible by providing tour audio and audio description on the Discovery Pens. ​Visually impaired visitors don't need to use their own smart device or mobile phone. Access to existing media is now provided by the site using Discovery Pen technology. The technology provides a unique opportunity to engage visitors in description of outdoor installations with independence and without the hassle of wires, routers, or complicated servers. amount of interest in a particular subject." ​Audio Description services and technology is the training of staff. 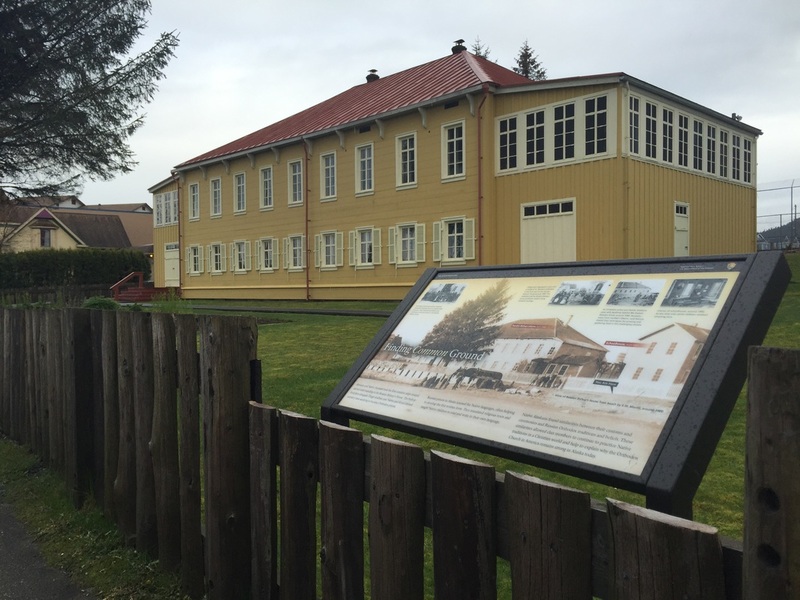 Lake Ledge provides site specific "Audio Description/Awareness Training" and "How to Use, Install and Maintain the Technology" training to both the Visitor Services Staff AND Maintenance Staff at Sitka National Historical Park. Training both maintenance and interpretive staff ensures that visitors will get the help they need. After training, all staff are aware of the technology that is available, where it is housed, how to maintain it, how to properly demonstrate use and how to help a visitor who has questions out on the trail or in the exhibit space.
" This project would appeal to a wide mix of learning styles, abilities, ages and backgrounds. The technologies add interest and exploration to the story as it unfolds."